A small Englishman called Mini Cooper is often a target of many tuners. 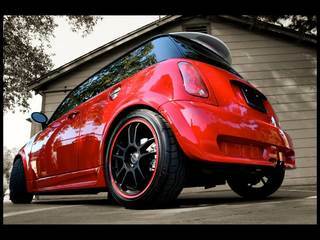 A designer Joe Iacono and Rick Leos, a famous hot-rodder from Autocraft of Torrance in South California like small, but cute vehicles, so they’ve taken one Mini Cooper to a garage. So these gentlemen has done one modification named Mini Cooper S Cabrio R53, but now they want to know what amount of power under the hood can this tiny car handle. So they’ve focused to its stuff under the hood. So the first thing done was modifications of head cylinders on the Mini’s 1.6 four cylinder engine. Of course, the performance tuning like this need better camshafts, tuned lead-ins and modified exhaust system. Also there’s new turbocharger and heavy duty intercooler. These ingredients boost the engine to some 300hp. It’s pity that there’s no closer info about its top speed, acceleration and other interesting stuff. This power engine must do miracles in case of the light-weight Mini. So the R56’s design looks exactly as the previous R53. A sporting bodykit bringing some muscles is a work of Joe Iacon. It’s not very aggressive, but decent with a sense for pure lines. And if you combine the bodykit with beautiful black rims with red hem and vented brake discs under; the best warrior mix is here to attract all nearby eyes. And the Englishman looks great! And what about its interior? The whole interior includes black leather upholstery with red stitches all around and it’s a great choice. Everyone who enters the car knows that it’s in the Airborne, because all Mini badges were removed and replaced with Airborne ones. 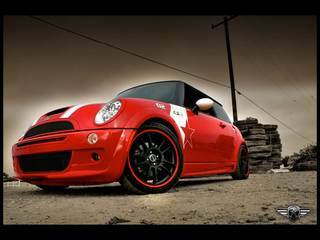 If you like this Mini and want to own this nice car in your garage don’t wait too long. There’ll be only 100 models available, but there’s a great chance that you’ll have the only Airborne in your county. What is your opinion about Airborne Mini Coupe?